Here in California, it’s finally starting to feel like spring. The days are warming and the wildflowers are starting to bloom. One of my favorites is the poppy. Witness a hillside, painted in orange, and you’ll have no problem understanding why it’s our State flower. Vigorous re-seeders, once started in an area they spread like, wait for it, wildflowers. Last fall I started carrying a package of poppy seeds in my jacket pocket. Ever day, while walking to lunch, I’d sprinkle a few along the side walk. It’s been fun, this spring, looking to see where they’ve popped up. Once the weather warms they’ll wither and die, planting next year’s crop. For the time being they’re “my” poppies to enjoy on my walk. This little patch of flowers was, of all places, next to a local bowling alley. There is a large, undeveloped, field that yields quite a crop every year. After driving by almost daily, one morning I finally stopped, put on my macro lens and crawled out into the field. I look forward to shooting them every year, wherever I can find them. I’m looking forward to the next workshop, in just over a week, where we’ll be shooting all sorts of wildflowers in the Merced River canyon, just outside the Western entrance of Yosemite. There’s still room if you’d like to join us. 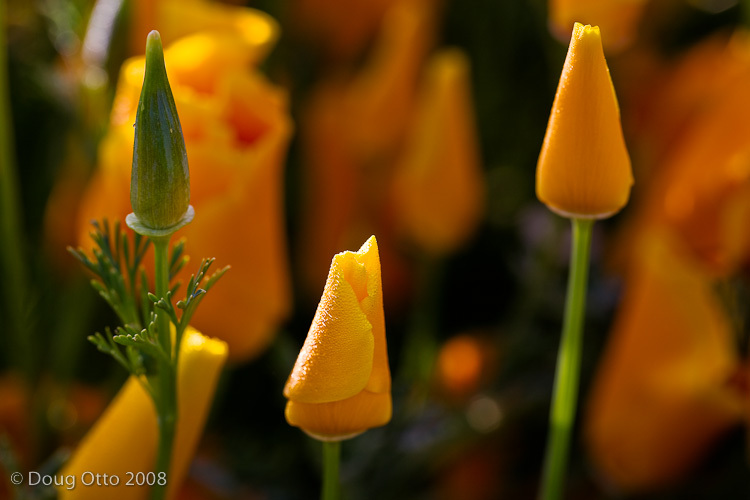 This entry was posted in Photography and tagged california poppy, canon 100 f/2.8, Canon 5D, doug otto, Photography, Poppies, Spring, spring time. Bookmark the permalink. ← What lens should I bring?